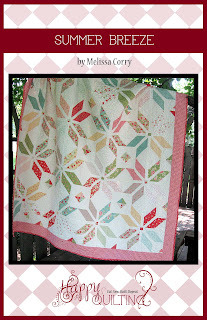 Happy Quilting: 100 Blocks Blog Hop & Giveaway!!! Quiltmakers 100 Blocks Blog Tour has arrived and one of it's first stops is here, at Happy Quilting!!! Yippee Skippee!!! And with that . . . here is my block :) It's called Gear Works and I am so excited to finally get to show it to you all!! And the fun thing about this block is you can really speed up the process of putting it together by strip piecing your rows together instead of doing individual blocks. But you don't have to wait to get get Quiltmaker;s 100 Blocks volume 5!!!! It's available now!!! And since no blog hop would be complete without giveaways, you can try your luck and see if you can win a copy!! I have 3 copies to giveaway to 3 lucky winners. And for fun, those 3 lucky winners will each receive copies of my patterns!!! Yippee Skippee!!! So . . . . What do you have to do for a chance to win????? Easy right. The giveaway is open to everyone and will end on Sunday May 6th and winners will be announced shortly after. Congratulations on your block being in the 100! My favorite - oh so many - but right now I am assembling strips (while doing string blocks) for a scrappy log cabin. Love the old traditional blocks. I love making pinwheel blocks and wonky log cabins. Very cute big boy quilt. Congrat's, log cabin is a favorite LOVE COGS! congrats on your block ... makes a nice quilt! my fav block is always the one i'm working on. am cutting to make blox for your diagonal little twister as a baby quilt for a dggs due in june, thank you very much! I like 9 Patches, Pinwheels and Ohio Stars best. I really liked your disappearing 16 block from the QAL a while back; still working on it. Congratulations Melissa, that is a fabulous block. The blocks I like to make are the ones I design. I have a lot of fun thinking up new ways to piece a block to create a total effect when multiplied for a quilt layout. I love the challenge. I love your block! Congratulations on being included in 100 Blocks! I also love your Summmer Breeze pattern so much! I have my fingers crossed on this giveaway - thanks for the chance to win! Congratulations. So exciting. I love this block so much it is just perfect for boys. My favorite blocks right now are the swoon blocks. What a fun block. It would look great with batiks, don't you think? I made some table runners using log cabin blocks recently, and think this is my new favorite block to work with. Such a cute block! I've done a lot of pinwheels, but I think I like improv blocks the most. I've always loved the churn dash block! Such a cute block that you've created! And I love seeing the block in your darling quilt. I'm loving Swoon blocks right now. Love how you simplified everything! Took me a while to get it though :) My favorite block to make is the Ohio Star, it's so easy and you can mix it up so many ways. Thanks for the chance to win! You are a bit early for the link to work to go to the Quilty Pleasures Blog. I'm so glad I got to TEST your block. I don't need to win a copy since they mailed me an early copy and an extra that I will give-away this week. Just had to say hello and congrats on a great Block! I like the fact that you use a lot of ! in your writing, I do too! I also like your yippee skippee it always makes me smile. What a great quilt for a boys room. As far as my favorite quilt block I am not sure yet as I am fairly new to quilting. I do like to make star blocks so at this point I would say that is my favorite. Congrats - your cog block/quilt is really nice. I'd love to win a copy of the magazine & your patterns. Probably my current fav blocks are Swoon (still) and the Japanese x and +. Both are so fun to make. I love this block - very refreshing after all the triangles I've been sewing lately! My favorite block, well, recently I learned how to do a string block and I LOVED it!! I like how it looks, and I love how easy they are! Thanks so much! What a great boys block this is! My favorite block to make is an English flying geese (it is dimensional). Ricky Tims taught it on one of the Quilt Show episodes-he said he learned it from some English quilters, so English geese it is. He had complete instructions for it in the first Quilt Life magazine & I have kept it for reference ever since. Yippee! And, I'm so happy to see your cute block and know it is in the this issue. Let the fireworks begin. My favourite block is Granny Square. I like how much it changes with different fabrics. I love the cogs too, they look really great. Well..I'm newer to quilting and new to tackling blocks, and I'm working on a block quilt that is abstract, then going to do the Bottled Rainbows quilt which is a block but...I'm a bit intimidated by traditional blocks, tis true! Stars... anything with stars, but I think you know that LOL. My first visit at your blog but I will be back. I love to do needlturn and love sewing dresden plates blocks. Would be happy if I won this magazine. Hugs from Norway. Right now I am making little houses from scrap. These little three-inch house blocks are so much fun! My fave block at the moment is log cabin, nice and quick! Thanks for the chance! I'm a new quilter and not sure of names yet, but I love to make pinwheel blocks even if they come out like crap :) Congrats! I've been making retro flowers of late, and am loving it, so I guess I'd have to say they're my current fave! Congrats on your cool block being published! I love the Storm at sea block. My favorite block at present is court step...thanks for the great giveaway!! Cute block, congrats on being in the magazine! One favorite block of mine is square in a square. How wonderful to be in 100 Blocks! Congrats! Currently I am working on a Birds in the Air block/quilt. Right now it's pinwheels. (Learned a shortcut) There's so many out there that I enjoy making that it's really hard to pin it down more. One of my favorite blocks to make is a Disappearing Nine Patch. The resulting quilt looks like you worked so much harder than you did. That is one of those timesaver blocks. Love the block! I think one of my favorites is the bear paw block. It may not be though by the time I finish the quilt for my bed! I love star blocks and foundation pieced blocks! Congratulations on your great block! My favorite, for sentimental reasons, is the good ol' log cabin. I love all blocks, but the LC was my first block to learn. Thanks so much! That's awesome! I bought the last edition, so I will definitely get this one too if I don't win one. Log cabin is my favorite block! I just finished up a quilt top from Twirling Around that I can't wait to show you. It is basted and ready to quilt. I love just about any foundation pieced block. Love you quilt and block. Would make an excellent quilt for boys. My favorite block is a simple Log Cabin one. You can use it in so many ways to get different looks in quilts. You can't go wrong with a Log Cabin. I'm a fairly new quilter, so I haven't tackled anything too tough yet, but I do love your gears quilt and I would have a perfect recipient for that quilt, my hubby, who is still a "gear" head building a 87 Corvette Engine L98 and stuffing it into a 88 Jeep Comanche. Thanks for the giveaway. 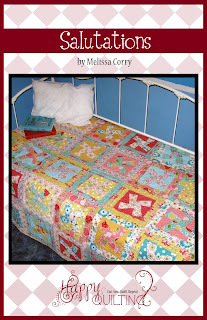 Thanks Melissa, I love it when you post ideas for guy quilts. Beautiful quilts! I adore your summer quilt! Pinwheels or the Dresden plate is a favourite of mine. Congrats on being in the book! Melissa, how exciting that you're in 100 Blocks - things are really hopping for you these days! I really don't have a favorite block - I like simple and I like difficult, and I like both pieced and appliqued. Congrats to you that is awesome news!! I love making wonky stars!! Very exciting! Congrats on being on the cover! Can't wait to get my copy of the magazine...it's my favorite! And my favorite block these days...HST's of any size! My favorite block will always be a log cabin, it's the first one I made and I felt like a quilter after I finished the quilt. I have to tell you, when I saw the cover of the new 100 blocks, your block really jumped out at me, so wonderfully different. You gear Block as a quilt reminds me of ancient Greek pottery. Great pattern! The quilt block I retrun to most often is a variation of a 9-patch. the traditional star block is my favorite! This is my first visit to your site and I have found heaps of inspiration. Keep it coming. I quilt as much as I can but there is never enough time to do everything as I am sure everyone else with echo my words. My favorite block is still the log cabin block. Maybe it is because it was the first block I made. Congrats to you. Your block is unique, I can see making that for boys. I am really enjoying the more modern blocks or unusual. I have all the 100block books, so can't miss out on this one, congrats on making it in. I really like your block and the way it comes together in this quilt. I'm really liking wonky log cabins right now. Congrats on making it to the cover :) and thanks for the chance! Fun block. Thanks for the opportunity to win a pattern! My favorite blocks are usually the simplest. I just finished a nine square baby quilt that I'm super proud of! I love star blocks, but this would really appeal to my boys. Thanks for sharing, and for the chance to win! 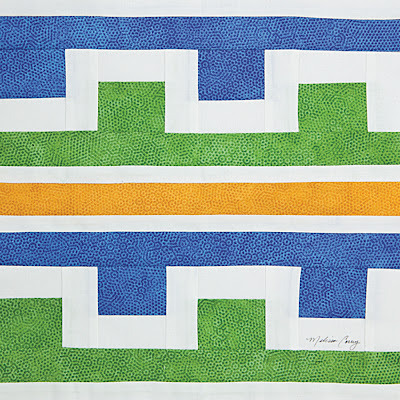 Congrats on having a block in this issue of 100 blocks and a quilt in the next issue of quilts from 100 blocks! Great block! That will make such a cute quilt! One of my favorite blocks to make is called Star - it's a star. (lol!) It is a paper pieced 4 point star and it is just lovely! I really like the look of your block. My favorite block is a nine patch. Thanks for a chance. Can't really say that I have a favorite block but these days I am into circular anything. New York Beauties, Dresden plates, wagon wheels and just plain circles. Love this cog style quilt. How clever! Love the new Cog block for boys. It reminds me of Seminol Indian quilting. I also appreciate showing how to construct the quilt top faster. I can always use those kind of tips. I love the pinwheel and the log cabin right now but I really have never met a block I didn't like, really! when playing with scraps I tend to gravitate to HST's. I'm thinking of changing that to strings for a while. Terrific pattern! I love the modern look of it. My all-time favorite block is the Sawtooth Star. I love its versatility. Love your block! My favorite block is a pinwheel because it creates movement in a quilt. Thanks "sew much" for this chance to win! This is such an adorable pattern! My favorite block is the Dresden Plate. I just love doing them. And 2nd is the Disappearing Nine Patch. Great idea for a block! Congratulations on being in the magazine. That must be very exciting and also to get into the quilt pattern magazine too. Your block is very cute and I like how the quilt came out too. It is nice to see some quilts for boys. I thought your block looked a bit like the top of the castles too so that was a bonus! Thanks for the chance to win a copy of the magazine and a pattern. Fun inspiration story! Fave block to make is still HST's. I am always experimenting though and my current phase is thread drawing. 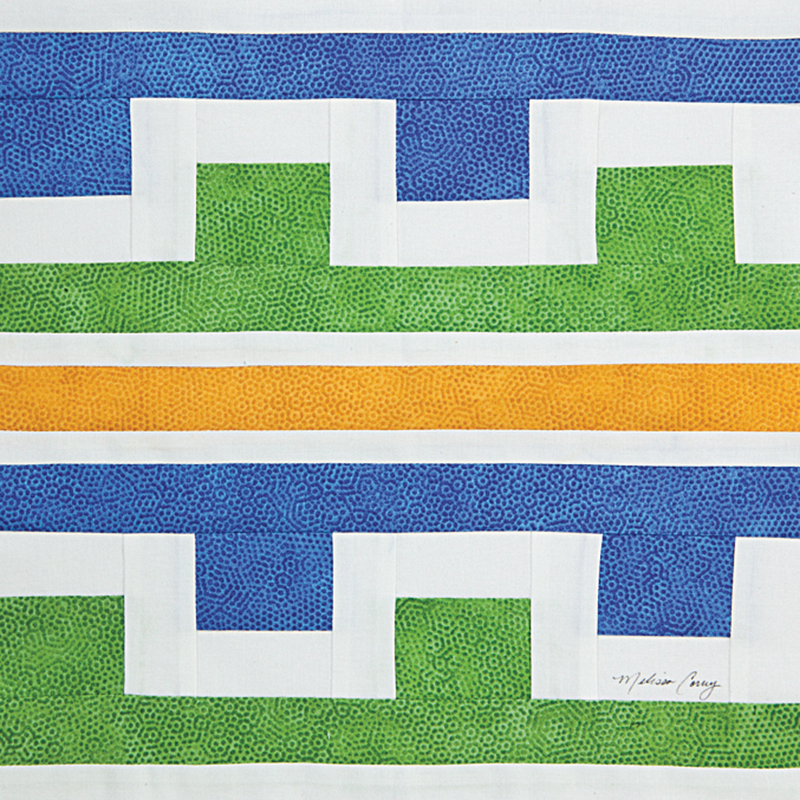 Congrats on the block and quilt in the next issue of the Quilts! My son thinks like your sons!! He is fascinated by the workings of gears, cogs, and such (and also by cartoon people about to get squished!! )I think my favorite block to piece would either be the 9-patch or "54 40 or Fight". I don't have a favourite block, I love them all! What a great give away! Beautiful patterns... I think my favorite block would be just about any kind of star! or pinwheel! I'm so new to quilting that I've only made a few different kinds of blocks. A pinwheel, a square in square, a nine-patch. I don't have a favorite yet. That's why I need this book! Thanks for the chance! Right now my favorite block to make is the Disappearing Nine Patch. I am brand new to quilting, and just completed my first quilt: a disappearing nine patch for a baby, using vintage linens. It turned out better than I expected! I would love to win one of the books, and your patterns! Thank you for the opportunity to win! Cute block (and quilt) idea!And enjoyed hearing about your cartoon inspiration. My favorite block to make is likely whatever I'm working on, but I do like the bear paw. Thanks so much for having this giveaway. It's hard to narrow my favorite blocks down to just one, but I do really like star blocks. Probably the Ohio Star is my favorite. I really like your "cool" block. This is definitely one that I will have to try the next time I need a boy quilt. My current favorite is the pineapple block. I'm working on my third quilt with this block. Thanks for the chance to win. I really like your block, nice to see a pattern that can be used for the guys. My favorite block is a simple nine patch, so many variations and a few changes and you have a whole new pattern. I'm a sucker for pinwheels. I love your block and can see many possibilities. I know exactly what fabric to use too, as it has gears on it! what a great quilt idea for a boy! My favorite block is Bear Paw - always has been. I can't tell you how many times I've made it in some fashion. I love to make basket blocks. Your new quilt block is great for little boys. Thank you for your giveaway. Great pattern.....would be nice for a guy / boys quilt. Thanks for the chance! Cathy B -- What a great blog you have! I am enjoying this 100 Block blog tour. And, I enjoy ANY and ALL quilt blocks.....except applique! haha Thank you! I like stars of any sort, although I haven't actually made and wonky versions yet. This is such a fun block! It may be prefect for my son's next quilt. What a great blog you have! I am enjoying this 100 Block blog tour. And, I enjoy ANY and ALL quilt blocks.....except applique! haha Thank you! I like your blog. My favorite block is the 9-patch. It's quick, easy, and always looks good. Love the boy block..you know..there aren't nearly enough. girls are easy but boys take a bit more thought. My favorite block to make..is one with triangles. I NEVER thought I'd say that but since I discovered thangles..Its a snap! I really enjoyed your blog, I enjoy all kinds of quilting, just not to much of one thing at a time. I do enjoy applique especially with wool. Would love to win a copy of QM 100 Blocks. Your block is great. I like the Card Trick block. Love the Gear Works! Reminds me of the cog railway up Mt. Washington in New Hampshire and that click-click jerky climb up a roller coaster. I love it how someone says something randomly and suddenly we are working on the next design|!! Inspiration comes from the strangest places!! oh did I mention I like !!! Lately the pinwheel block and the drunkards path blocks are two of my favorites. I love your block and quilt because boys are so hard to make quilts for. Thanks for desiging for the boys in our lives :) I like !! too!! You are so creative! I have boys, too, so am familiar with gears, wheels, and all things mechanical. Inspiration for a quilt can come from the most unusual places, right? I would love to win this new book, 100 Quilt Blocks Vol. 5. I love that gear block...it makes for an awesome big boy quilt. I have been sewing a lot of triangles, so right now I'd have to say that my favorite block would be a 9 patch or something really easy and square! How exciting to have your block in the mag! Good for you! For some reason I keep going back to log cabin blocks as a stand-by. I am going to try your block I think it would make a great "guy quilt"
I love the drunkard's path block. I use to like the nine patch but I just finished a "Blooming Nine Patch" quilt (in 5 days) at my guild retreat, that used 244 small nine patch blocks, so I'm not liking them at the moment...lol. I really like the 54/40 or Fight block: http://quilterscache.com/F/FiftyFourFortyorFightBlock.html. I love making those little triangle units with a cool ruler I got from Eleanor Burns' site! I love your block.I love star quilts blocks and paper piecing.Thanks for the opportunity to win!! Great little boys quilt for sure! My fav block is whatever I am working on at the moment. New York Beauty is it for right now. thanks for the chance to win. I like your block and how the idea ends up here. You are a busy gal and congrats to you. I have been working on a couple giveaway/donation childrens quilts w/ Strawberry Shortcake but do like log cabin block and 9 patch so far. Oh, thank you for coming up with a "boy" block. My boys would love it! As for my favorite block? I'm loving putting together some Dresdens, but I'd like to try my hand at hexies. Thanks for the giveaway! I love any block that has a star in it. Log cabin blocks are another big avorite. I love Log Cabin the best--I never tire of it. So many layout possibilities, too. Melissa, I think my favorite block is the one I'm currently working on...if all is going well!!! Love the block you've done, and will try to be patient for the other magazine...and thank you for the chance to win vol 5 and your patterns! Love the "gear" block! I can see the possibility of different settings for this one. Simple blocks that look complicated are on the top of my list. Cute, cute block, love how it looks in a quilt! I love looking at a block when it is finished and thinking, "wow, I really made that! It looks so cool!" Looks like a really cute block. I am a beginner quilter so I have not made many blocks but I am working up to the Swoon block. I'm currently making wonky stars and loving them. I am trying to practice on my needle turn applique right now...so I would guess that is my favorite. Applique blocks!! I really enjoyed making the Japanese + & X blocks from the quilt-along on flikr! How awesome to see your block right there on the cover of the magazine! My favorite block to make in general is the friendship star, but to hi-light fussy cut squares, I absolutely love making the churn dash block. I love to make flying geese! Thanks so much. Your pattern looks great! I love the colors in your patter, they go very nicely! Thanks for the chance for the giveaway as well! I really like making patchy blocks- I just completed a quilt where I made christmas trees from green or holiday scraps. Super fun to put together! Congratulations on the block. My favorite block is anything that looks remotely like a star........ Love them all. Love your patterns - they look so inviting - Summer breeze looks like a star, doesn't it??? Thanks for the chance to win! I'm loving "improv" right now. Nice to not have to think too much - just sew random pieces together and not worry about that perfect 1/4" !! I really don't have a favorite but I do admire many of them. Right now I guess you could say my favorite is a strippy square. Ya really don't have to think much when doing it and it uses up your stash. Congratulations! I'm really in love with the Sawtooth Star right now - traditional and simple. Thanks for the giveaway! such a tough question, to pick my favorite block. I think anything with stars. I'm usually stumped when asked to name my favorite block. Just lately, I've made lots of pinwheel blocks. I love making them so they have become my new favorite block. Congratulations on having your block in Vol. 5. Great pattern for boys! Have a wonderful week! I can't say that I have a favorite block. For quick and simple I love rail fence, but that said, give me a really challenging foundation pieced block and I'm happy. I also love machine applique. OK I'm all over the place with this question! Thanks for the chance on your giveaway! 'Geer Works' is a very pretty quilt! The colors are perfect for a little boy quilt. My favorite quilt block is probably a log-cabin or a variation of it. They are fun to make. My favorite block is a pinwheel one. Thanks for the chance to win one of your beautiful patterns. Congratulations - the block looks really cool and has interesting possibilities. Thanks for the giveaway. I'm so looking forward to making this block into a quilt! I'm the laziest quilter ever, and strip-piecing is the best. Thanks so much! One of my favorite blocks is card trick. I enjoy whatever quilt/block I am working on at the moment. I have no favorites. I don't have a favorite; any block has such potential to make a beautiful quilt. I liked your block...such a great idea for boy sorts of quilts...my engineer sons would love the graphic of it. 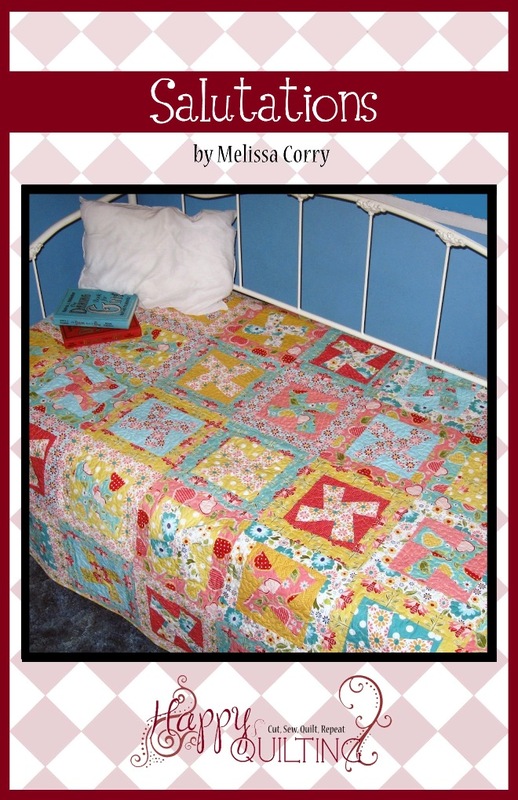 Love your Summer Breeze quilt and enjoy reading your blog. I just love your blog. Yeah - three copies of Quiltmaker's 100 Blocks Volume 5 and copies of Salutations and Summer Breeze too. I have had my eye on both of those patterns for sometime now. Guess what? My newest favorite block has now become Gear Works. That is so cute and so darn easy. Thank you for participating and giving us all a chance to win. What a fun block & so cute made up for a little boy. I really like your Summer Breeze pattern & can picture that made up for one of my granddaughters. Very cute design, and quilt design! Love the easy way to make it. I enjoy many different blocks. I love the challenge of making stars, and then love doing something simple and strippy next. The variety is what thrills me! Great pattern designs, too. Looking forward to seeing more. Beautiful quilt; will have to try it. I don't know that I have a favorite block but I sure love a New York Beauty! Thanks for the giveaway. I love the log cabin block. Umm...I'm new to quilting so I don't really have a favorite block just yet. I've been really wanting to try out the Granny Square block and the X & + block too. I have a feeling that one of those may be my favorites. LOVE your work and thanks for the chance. Wow that looks awesome, perfect for boys! That is a great quilt pattern for a boy (maybe this next grandchild will be a boy) What boy doesn't like to squish things! What a great pattern! I just started quilting (literally... yesterday I just started working on my first quilt top!). Since it's my first quilt ever, I'd have to say the quilt block I like (the only one I know!) is the Double Slice Layer Cake. Congrats on being featured!! Love your summer breeze pattern!! I love to make quilts using Log Cabin blocks. The possibilities are endless. I am a huge log cabin fan. Just love it scrappy or planned. Love your block, had never thought about "gears" as a design element before. I like many traditional blocks, but fins myself making a lot of pinwheels. I love making 9 patch blocks and slashing them to bits and turning them into something new! Congrats on your block - it's so creative and different! Yay! What a cute story behind your block Melissa. And the block is a good one too. Congrats on getting into Issue 5 and also for the secret block too that you can't show us yet. I haven't made one yet, but the Granny Squares blocks I've been seeing all over really make me want to make some soon. I really love pinwheels too. Thus far my fav would be the log cabin blocks that I made out of my children's embroidery work. I love when inspiration comes from the children. That leads to lasting memories. My favorite above all favorites is the dresden plate. Since I bought the EASY DRESDEN template I have done quite a few things with the block, and they all look stunning! congratulations on a wonderful block! thanks for the great giveaway - I love log cabin blocks! Thanks for the chance to win. I'm not sure what my favorite block to make is. I'm not sure I've made to many twice. Love your block - I will definitely be making this one. The log cabin is my favorite block because it can be made so many different ways. Thanks for the chance to win. I love to make wonky star blocks. Thanks for the chance to win. Your quilt designs are darling! I am a brand new quilter, but have done a plus quilt and am working on another with squares and I'm not sure what the pattern is called, as I just followed a picture. I like your gears block and am considering it for my grandson's big bed. I've always liked bear's paw and am not even sure why. Congratulations on having your block chosen. I don't know that I have a favorite block as I like to keep trying new things.